This is our most popular obstacle course. 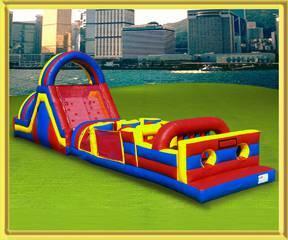 2 racers squeeze, crawl, jump, duck, and maneuver through a variety of obstacles before reaching a giant 16’ climbing wall. Once you reach the top you’ll be able to slide down a giant 16’ slide on the back side of the climb to victory.